Last week I wrote a story about my husband apologizing to our son. Apologies are good and as the story shared, help restore relationships. But I started thinking, that sometimes we apologize for things we shouldn’t. Then, seconds later as our paths literally crossed she said to us, “Oh I’m sorry, let us scoot out of your way.” Adam and I chuckled. I wonder where the little girl learned to say I’m sorry so often! It’s easier to say I’m sorry when you accidentally bump into someone in a crowded store than it is when you’ve done something hurtful and need to apologize to restore the relationship. But at the same time, parenting and relationships are hard, and we often, like the mom said apologize for the wrong things. So in honor of those who make too many apologies (me included! ), here are 2 situations we should never apologize for. Christmas cards line my window sill, familiar carols jingle from the radio, lights twinkle through the windows, darkened from the night sky, and hot chocolate spills on the couch as the kids cuddle close. It’s Christmas time! This season ushers in plenty of warm, cozy feelings, but also spreads a blanket of anxiety. We rush from church activity to school activity and store to store shopping for bargains at the biggest sale of the year. We search for the perfect gift for the perfect party. Pinterest floods our inbox with magnificent, museum quality, must-have decorations that leave us feeling less-than if we don’t download and make them right now. With all this pressure it’s easy to lose the holiday cheer. By the end of December, our relationships with those we love most feel the strain. How do we navigate the holidays and keep our marriage thriving? When I was in school, I remember my English teacher stressing the importance of writing within the margins. She took points off the paper if I wrote beyond either red line. She said staying within the margins made the paper neater and easier to read. Staying within the margin is important in life too. It can make life neater and easier to handle. Margins give us room to breathe. We can freely fill in the lines with enjoyable activities, but leave room in the margins to breathe. Let’s face it: So many activities appeal to us during the holidays. We feel like we must do them all, but we can’t. We can pick a few favorites and do them joyfully, and then gracefully say no to the others and take some time to rest, relax and read a book. There’s no reason to rush so hard that it takes you till February to recover. My Papa has been my whole world since I can remember. When I was 4 he took me down to the creek and showed me how to skip rocks. When I couldn’t exactly skip them, we resorted to just throwing them in the water under the bridge. When I was learning how to ride a bike, he ran beside me. When I was learning how to drive a car he took me to the steepest hill at Holly Lake, put on the parking brake and told me to let out the clutch slowly. Then he rolled his eyes when the car died. He took me fishing down at the dock. He took me skiing on spring break. He played volleyball with me when it was volleyball season. He ran with me during cross country season. I watched him build a house for three years, then five years later sell it and move to a house two blocks down and re-model it. There’s never been a task too hard, an order too tall or a request of mine un-granted. He was never too busy, too broke or too tired to be with me. And I’m a better woman because of it. If you’ve done any running you know there’s a lot of techniques out there. Get the right shoes, have the right form, relax your arms, that sort of thing. I try to run regularly. Sometimes I pay attention to these things and sometimes I don’t. This particular day I did. I noticed toward the end of my route that I used my arms more than usual. Pumping them back and forth in sync with the rhythm of my body propelled me along faster without tiring out as quickly as in previous days. I immediately thought of the body of Christ. When the arm swings in unison with the legs running, in time with the heart beating, the breath going in and out of the lungs, the feet pounding the surface at just the right time and angle – the body is working smoothly and effectively. If you mix all the colors of the rainbow together, you get brown. Yes, roses have thorns. And so do I! If I’m going to be working in my rose garden, what do I need to do? Do I reach in unprotected and then curse the rose for hurting me? I could, but is it really the roses’ fault? What did I think would happen?! No, I would wear gloves and possibly even long sleeves with pants depending on how big the garden is and what I’m doing there. I also might carry some Band-Aids and Neosporin close by in case of an accidental scrape. The fact is part of the rose IS its THORN. Since that first bite of forbidden fruit eaten in the Garden of Eden, we have dealt with thorns. It’s just part of it. Part of being in community with other human beings is dealing with their thorns. So, we can pretend they aren’t there, get scratched, curse the friend and never plant roses again. OR we can look at the situation for what it is – we ALL have thorns – and dress accordingly, prepared to apply God’s grace, even liberally when/where needed! Think for a minute about the rose thorn. Why do thorns grow around this beautiful flower? Could it be a source of protection against predators? 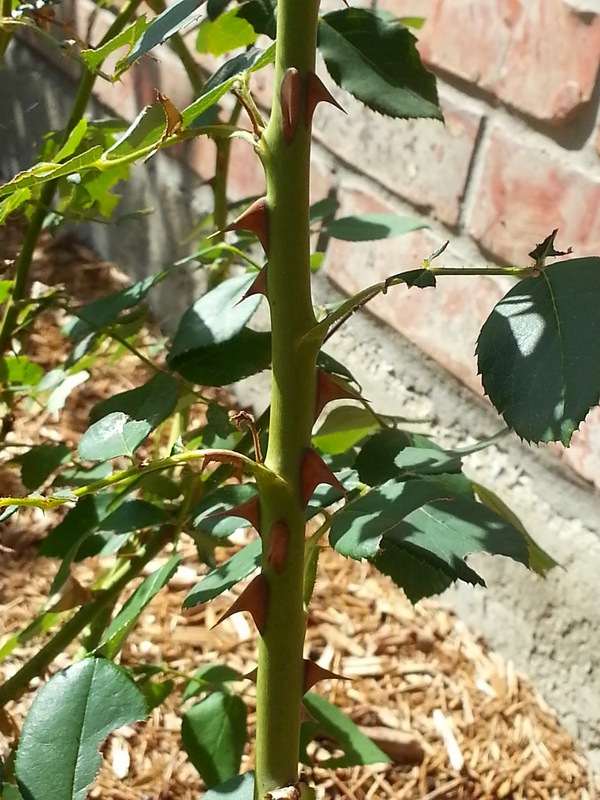 I bet if we thought about it, some of the “thorns” on OUR stem could trace back to protection mechanisms. Maybe we’ve been hurt, so to protect ourselves from that incident ever happening again, we’ve grown a thorn to keep that particular predator away. Thorns could also be as a result of what kind of home we grew up in. We’ve created certain boundary lines to protect our flower. Whatever the case, thorns aren’t all bad. They provide a valuable level of protection for a beautiful specimen of nature, and also remind us that we’re not in Heaven yet. The thorn does, however demand respect when handling. I believe we do to. That’s why in Ephesians Paul encourages us to speak the TRUTH in LOVE to each other. The context of this exhortation is that we grow up. We stop being infants and blown about from here to there with every new season of “cunning and craftiness of men in their deceitful scheming”. (4:14) Paul pleads with the church to speak truth to one another and grow up into Christ as the Head of this body. “From Him the whole body, joined and held together by every supporting ligament, grows and builds itself up in love, as each part does its work.” (4:16) What a beautiful picture of the body of Christ! Do you think the early church body dealt with any thorns? You bet! We can’t avoid them. Instead, if we have any chance at looking appealing to non-believers, we must learn how to deal with them. “In the garden of life, friends are the flowers” sounds like relationships (and gardening for that matter!) come easy. But just like gardening, friendships must be watered, tended to, pruned, fertilized and much more. I’m thankful we have a Perfect Gardner, Jesus Himself who says He will help us through the thorns and roses of life.